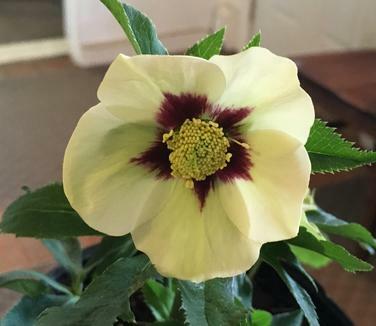 ‘Spanish Flare’ Lenten Rose comes from the Honeymoon™ Series of Hellebores. The large yellow flowers appear in late winter and early spring, and are made even more striking by the vivid maroon centers around the nectaries. All Hellebore flowers persist for a very long time, changing to greenish hues as they age. Evergreen and dry site tolerant, Helleborus x ‘Spanish Flare’ is a lovely addition to the shade garden. Hybridized by Hans Hansen.